We are counted amongst the most reliable Manufacturers and Suppliers of Worm Wheel. Basically a gear which has one tooth is called a worm. The Tooth is in the form of a screw thread where a Worm Wheel meshes with the worm. 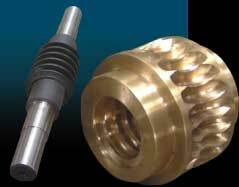 The Worm Wheel offered by us is a Helical Gear with teeth inclined so that they can engage with the thread like worm. It transmits torque and rotary motion through a right angle.